Forward-thinking businesses are taking concrete steps to break down departmental silos that impede the creation, management, and flow of high-value content across their enterprise. These businesses understand that while, for most, these critical information assets have no real book value, they have a very high intrinsic value to their organization that must be nurtured and grown. These businesses realize that to bring down the barriers, they need a coordinated effort to manage the required skills, processes, technology, and infrastructure to support the organization and bring better experiences to end customers. 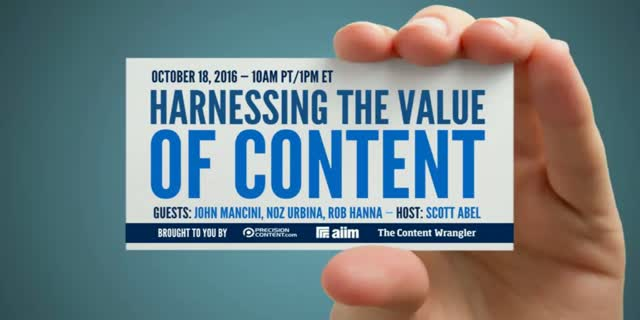 On October 18, join Scott Abel, The Content Wrangler, for this free, one-hour panel discussion and Q&A. Scott will host John Mancini, Chief Evangelist and Past-President of the Association for Information and Image Management (AIIM), Rob Hanna, President of Precision Content, and Noz Urbina, Founder of Urbina Consulting. Insight from this panel of experts will help you kick-start a dialog for bringing together the different parts of your organization that are responsible for various aspects of content marketing, content creation, and information management. The objective is to give you several key talking points to help your organization make the move towards further harnessing the value of content within your enterprise.